The questions have haunted our nation for half a century: Was the President killed by a single gunman? Was Lee Harvey Oswald part of a conspiracy? Did the Warren Commission discover the whole truth of what happened on November 22, 1963? Philip Shenon, a veteran investigative journalist who spent most of his career at the New York Times, finally provides many of the answers. Though A Cruel and Shocking Act began as Shenon’s attempt to write the first insider’s history of the Warren Commission, it quickly became something much larger and more important when he discovered startling information that was withheld from the Warren Commission by the CIA, FBI and others in power in Washington. Shenon shows how the commission’s ten-month investigation was doomed to fail because the man leading it—Chief Justice Earl Warren—was more committed to protecting the Kennedy family than getting to the full truth about what happened on that tragic day. A taut, page-turning narrative, Shenon’s book features some of the most compelling figures of the twentieth century—Bobby Kennedy, Jackie Kennedy, Lyndon Johnson, J. Edgar Hoover, Chief Justice Warren, CIA spymasters Allen Dulles and Richard Helms, as well as the CIA’s treacherous “molehunter,” James Jesus Angleton. Based on hundreds of interviews and unprecedented access to the surviving commission staffers and many other key players, Philip Shenon’s authoritative, scrupulously researched book will forever change the way we think about the Kennedy assassination and about the deeply flawed investigation that followed. There is no way to know exactly when Charles William Thomas began to think about suicide. Who could really know such a thing? Years later, congressional investigators could offer only their strong suspicions about what had finally led Thomas, a former American diplomat who had spent most of his career in Africa and Latin America, to kill himself. On Monday, April 12, 1971, at about four p.m., he put a gun to his head on the second floor of his family’s modest rented house, near the shores of the Potomac River, in Washington, DC. His wife, downstairs, thought at first that the boiler had exploded. Certainly two years earlier, in the summer of 1969, Thomas had reason to be disheartened. He was forty-seven years old, with a wife and two young daughters to support, and he knew his career at the State Department was over. It was official, even though he still could not fathom why he was being forced out of a job that he loved and that he thought—that he knew—he did well. The department long had an “up or out” policy for members of the diplomatic corps, similar to the military. Either you were promoted up the ranks or your career was over. And since he had been denied a promotion to another embassy abroad or to a supervisor’s desk in Washington, Thomas was “selected out,” to use the department’s Orwellian terminology for being fired. After eighteen fulfilling, mostly happy years wandering the globe on behalf of his country, he was told he had no job. At first, he thought it must be a mistake, his wife, Cynthia, said. His personnel records were exemplary, including a recent inspection report that described him as “one of the most valuable officers” in the State Department, whose promotion was “long overdue.” After he was formally “selected out,” however, there was no easy way to appeal the decision. And Thomas, a proud, often stoical man, found it demoralizing even to try. He had already begun boxing up his belongings in his office and wondering if, at his age, it would be possible to begin a new career. He did have one piece of unfinished business with the department before he departed. And on July 25, 1969, he finished typing up a three-page memo, and a one-page cover letter, that he addressed to his ultimate boss at the department: William P. Rogers, President Nixon’s secretary of state. Colleagues might have told Thomas it was presumptuous for a midlevel diplomat to write directly to the secretary, but Thomas had reason to believe that going to Rogers was his only real hope of getting someone’s attention. Thomas was not trying to save his job; it was too late for that, he told his family. Instead, the memo was a final attempt to resolve what had been—apart from the puzzle of his dismissal—the biggest, most confounding mystery of his professional life. Rogers was new to the State Department, sworn in only six months earlier along with the rest of Nixon’s cabinet. Thomas hoped Rogers might be willing to second-guess the career diplomats at the department who—for nearly four years—had ignored the remarkable story that Thomas kept trying to tell them. His tone was formal and polite, which was certainly in character for Charles William Thomas, who used his middle name in official correspondence to avoid confusion with another Charles W. Thomas who worked at the department. He wanted to be remembered as a diplomat—to be diplomatic—to the end. He knew his memo outlined potentially explosive national-security information, and he wanted to be careful not to be perceived as reckless. He had no interest in leaving the State Department with a reputation of being some sort of crazy conspiracy theorist. At the end of the 1960s, there were plenty of craven, headline-grabbing “truth-seekers” peddling conspiracies about President Kennedy’s assassination. Thomas did not want to be lumped in with them in the history books—or in the classified personnel archives of the State Department, for that matter. His memo contained no language suggesting the personal demons that would lead him to take his life two years later. Secretary Rogers would have had easy access to the details of Thomas’s career, and they were impressive. Thomas was a self-made man, orphaned as a boy in Texas and raised in the home of an older sister in Fort Wayne, Indiana. He served as a navy fighter pilot in World War II, then enrolled at Northwestern University in Evanston, Illinois, where he earned both a bachelor’s and a law degree. Foreign languages came easily; he was fluent in French and Spanish and, over the years, developed a working knowledge of German, Italian, Portuguese, and Creole; the last had been valuable during a diplomatic posting in Haiti. After Northwestern, he studied in Europe and received a doctorate in international law at the University of Paris. In 1951, he joined the State Department and served initially in hardship posts in West Africa, where, despite several severe bouts of malaria, he was remembered for his good humor and enthusiasm. His friends said he was “the diplomat from central casting”—six feet tall, blond, preppy handsome, articulate, and charming. Early in his career, colleagues assumed he was destined to achieve the rank of ambassador, running his own embassy. In 1964, Thomas was named a political officer in the United States embassy in Mexico, where he was posted for nearly three years. Mexico City was considered an especially important assignment in the 1960s since the city was a Cold War hot spot—Latin America’s answer to Berlin or Vienna. There were big Cuban and Soviet embassies, the largest in Latin America for both Communist governments. And the activities of Cuban and Soviet diplomats, and the many spies posing as diplomats, could be closely monitored by the United States with the assistance of Mexico’s normally cooperative police agencies. The CIA believed that the Russian embassy in Mexico was the KGB’s base for “wet operations”—assassinations, in the CIA’s jargon—in the Western Hemisphere. (It would have been too risky for the KGB to run those operations out of the Russian embassy in Washington.) Mexico City had itself been the scene of Kremlin-ordered violence in the past. In 1940, Soviet leader Joseph Stalin dispatched assassins to Mexico City to kill his rival Leon Trotsky, who was living there in exile. Mexico City’s reputation as a center of Cold War intrigue was cemented by the disclosure that Lee Harvey Oswald had visited the city only several weeks before the assassination of President John F. Kennedy in Dallas on Friday, November 22, 1963. Details about Oswald’s Mexico trip were revealed in news reports published within days of the president’s murder, giving birth to some of the first serious conspiracy theories about foreign involvement in the assassination. Everything about Oswald’s stay in Mexico, which had reportedly lasted six days, was suspicious. A self-proclaimed Marxist, Oswald, who did not hide his Communist leanings even while serving in the U.S. Marine Corps, visited both the Cuban and Soviet embassies in Mexico City. It appeared he had gone there to get visas that would allow him, ultimately, to defect to Cuba. It would be his second defection attempt. He had tried to renounce his American citizenship when he traveled to the Soviet Union in 1959, only to decide to return to the United States from Russia three years later, saying that he had come to disdain Moscow’s brand of Communism, with its petty corruptions and mazelike bureaucracy. He hoped Fidel Castro and his followers in Havana would prove more loyal to the ideals of Marx. The details of what Thomas had learned were so complex that he felt the need to number each paragraph in the memo. He enclosed several other documents that were full of references to accented Spanish-language names and obscure locations in Mexico City; they offered a complicated time line of long-ago events. His central message, however, was this: the Warren Commission had overlooked—or never had a chance to see—intelligence suggesting that a plot to kill Kennedy might have been hatched, or at least encouraged, by Cuban diplomats and spies stationed in the Mexican capital, and that Oswald was introduced to this nest of spies in September 1963 by a vivacious young Mexican woman who was a fellow champion of Castro’s revolution. The woman, Thomas was told, had briefly been Oswald’s mistress in Mexico City. As he wrote the memo, Thomas must have realized again how improbable—even absurd—this might all sound to his soon-to-be former colleagues at the State Department. If any of his information was right, how could the Warren Commission have missed it? In the body of the memo, he identified, by name, the principal source of his information: Elena Garro de Paz, a popular and critically acclaimed Mexican novelist of the 1960s. Her fame was enhanced by her marriage to one of Mexico’s most celebrated writers and poets, Octavio Paz, who later won the Nobel Prize in Literature. A sharp-witted, mercurial woman, Garro, who was in her midforties when she met Thomas, spoke several languages and had lived in Europe for years before returning to Mexico in 1963. She had done graduate work at both the University of California at Berkeley and, like Thomas, the University of Paris. The two had become friends on Mexico City’s lively social circuit and, in December 1965, she offered the American diplomat a tantalizing story. She revealed—reluctantly, Thomas said—that she had encountered Oswald at a party of Castro sympathizers during his visit in the fall of 1963. It had been a “twist party”—Chubby Checker’s hit song was wildly popular in Mexico, too—and Oswald was not the only American there, Garro said. He had been in the company of two young “beatnik” American men. “The three were evidently friends, because she saw them by chance the next day walking down the street together,” Thomas wrote. At the party, Oswald wore a black sweater and “tended to be silent and stared a lot at the floor,” Garro recalled. She did not talk to any of the Americans or learn their names. She said she learned Oswald’s name only after seeing his photograph in Mexican newspapers and on television after the assassination. A senior Cuban diplomat was also at the party, she said. Eusebio Azque, who held the title of consul, ran the embassy’s visa office. (In the memo, Thomas said that Azque’s other duties included espionage; the U.S. embassy believed he was a high-ranking officer in Castro’s spy service, the Dirección General de Inteligencia, or DGI.) It was Azque’s consular office in Mexico City that Oswald had visited in hopes of obtaining a Cuban visa. Garro, a fierce anti-Communist, loathed the Cuban diplomat. Before Kennedy’s assassination, she said, she had heard Azque speak openly of his hope that someone would kill the American president, given the threat that Kennedy posed to the survival of the Castro government. The October 1962 Cuban missile crisis, and the bungled CIA-sponsored Bay of Pigs invasion a year before that, would have been fresh in Azque’s memory. Garro recalled a party at which she and other guests overheard a “heated discussion” in which Azque supported the view that “the only solution was to kill him”—President Kennedy. Also at the party, Garro said, was a notably pretty twenty-five-year-old Mexican woman who worked for Azque at the consulate: Silvia Tirado de Duran, who was related to Garro by marriage. Duran was an outspoken Socialist and a supporter of Castro, which helped explain how she had gotten a job working for the Cubans. Thomas found a copy of the Warren Commission report in the embassy’s library and could see that Duran’s name appeared dozens of times in its pages; the commission determined it was Duran who had dealt with Oswald during his visits to the Cuban mission in Mexico. She had helped him fill out his visa application, and it appeared that she had gone out of her way to assist him. Duran’s name and phone number were found in a notebook seized among Oswald’s belongings. Thomas asked Garro if she had told this story to anyone else. She explained that, for nearly a year after the assassination, she had kept quiet, fearing her information might somehow endanger her safety, as well as the safety of her twenty-six-year-old daughter, who also remembered seeing Oswald at the party. In the fall of 1964, however, just after the Warren Commission had ended its investigation, she found the nerve to meet with American embassy officials in Mexico City and tell them what she knew. To her surprise, she said, she heard nothing from the embassy after that. According to his memo, Thomas’s senior colleagues in the embassy knew all about Garro’s claims because he had told them. He wrote them long reports after each of his conversations with her in 1965. He set aside part of Christmas Day that year to write a memo—it was dated December 25—recounting what he had heard that morning from her at a holiday party. He made sure his memos went straight to Winston “Win” Scott, the CIA’s station chief in Mexico. The courtly, Alabama-born Scott, then fifty-six years old, had sources at the highest levels of the Mexican government, including a series of Mexican presidents who sought his protection and whose top aides became some of the CIA’s best-paid informants in the country. Many Mexican officials saw Scott, who took up his post in 1956, as far more powerful than any of the American ambassadors he had worked with. His deputies knew he also wielded extraordinary influence back at CIA headquarters in Langley, Virginia, in part because of his decades-long friendship with James Jesus Angleton, the CIA’s counterintelligence director—the agency’s chief “mole hunter.” Both men had been with the CIA since its founding in 1947. In his memo to Rogers, Thomas said that Scott and others in the embassy did not pursue the information tying Oswald to the Cubans. After initial expressions of interest, Scott essentially ignored what Thomas had learned, even when Thomas tried to raise the questions again in 1967, as he prepared to leave Mexico for a new posting in Washington. Thomas’s last day of employment at the State Department was July 31, 1969, only six days after the date on his memo to Secretary Rogers. It is not clear from the department’s records if Thomas was immediately informed about what happened next with his memo, but the department did pass on his information—to the CIA. On August 29, in a letter stamped confidential, the State Department’s Division of Protective Security wrote to the CIA and asked for an appraisal of Thomas’s material. It provided the agency with Thomas’s memo, along with several supporting documents. A little less than three weeks later, the CIA sent back its curt reply. It read, in full: “Subject: Charles William Thomas. Reference is made to your memorandum of 28 August 1969. We have examined the attachments, and see no need for further action. A copy of this reply has been sent to the Federal Bureau of Investigation and the United States Secret Service.” The memo was signed by Angleton, the CIA counterintelligence chief, and one of his deputies, Raymond Rocca. Thomas was notified of the CIA’s rebuff and, as far as he knew, that was where the paper trail stopped; apparently, nothing more was to be done. After his suicide two years later, the Washington Post published a 186-word obituary that made only a passing reference to how Thomas had died: “Police said the cause of death was gunshot wounds.” (Actually, his death certificate identified only one gunshot wound—to his right temple.) After pleas from his family, congressional investigators reviewed his personnel files and determined that Thomas had been “selected out” from the State Department in error. A clerical mistake had cost him his career, or so it appeared; an important job performance report endorsing his promotion had been left out of his personnel files for reasons that were never fully explained. Congressional investigators later suspected that there had been other factors in the decision to force Thomas out, including his persistent, unwelcome effort to get someone to follow up on Garro’s allegations. “I always thought it was linked, somehow, to his questions about Oswald,” said a former investigator for the House of Representatives. “It was impossible to prove, though. If he was forced out because of Mexico City, it was all done with a wink and a nod.” There were rumors in Mexico that one of Win Scott’s deputies at the embassy there had mounted a whispering campaign intended to damage Thomas’s reputation—for reasons that Thomas’s many Mexican friends could never fathom. And so began a five-year reporting project to piece together the inside story of the most important, and most misunderstood, homicide investigation of the twentieth century—the Warren Commission’s investigation of the assassination of President Kennedy. Chief Justice Warren and the other six members of the commission died long before I began work on this book—the last surviving member, former president Gerald Ford, died in 2006—but my caller was right that most of the then young lawyers who did the actual detective work in 1964 were still alive. And I’m grateful that almost all of them have been willing to speak with me. Sadly, time has begun to catch up with my sources, too. Some of the commission investigators and other key figures who granted me interviews for the book have died, most notably former senator Arlen Specter of Pennsylvania, who had been a junior staff lawyer on the commission. This book is therefore their last testament about the work of the commission and about the Kennedy assassination. I was the last journalist to interview former FBI special agent James Hosty, a central witness before the Warren Commission because he had Lee Harvey Oswald under surveillance in Dallas for months before the assassination. Hosty faced obvious questions about why he and his colleagues at the FBI had not been able to stop Oswald. In interviews shortly before his death in June 2011, Hosty insisted that he became the scapegoat—both within the FBI and for the Warren Commission—for the incompetence and duplicity of others in the government. 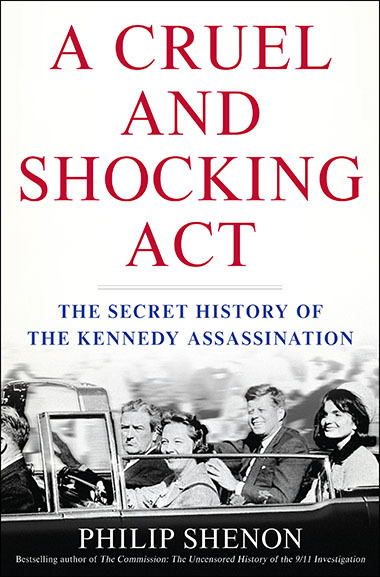 The title of this book is drawn from the first line of the introduction to the commission’s final report: “The assassination of John Fitzgerald Kennedy on November 22, 1963, was a cruel and shocking act of violence directed against a man, a family, a nation, and against all mankind.” But while A Cruel and Shocking Act began as an attempt to write the first comprehensive inside history of the Warren Commission, it has become something much larger and, I believe, more important. In many ways, this book is an account of my discovery of how much of the truth about the Kennedy assassination has still not been told, and how much of the evidence about the president’s murder was covered up or destroyed—shredded, incinerated, or erased—before it could reach the commission. Senior officials at both the CIA and the FBI hid information from the panel, apparently in hopes of concealing just how much they had known about Lee Harvey Oswald and the threat that he posed. As this book will reveal for the first time, important witnesses to events surrounding the assassination were ignored or were threatened into silence. The reporting for this book has taken me to places and introduced me to people I would never have imagined would be so important to understanding President Kennedy’s death. I became a victim of the dual curse faced by anyone who tries to get closer to the truth about the assassination—of too little information and too much. I made the astonishing, nearly simultaneous discovery of how much vital evidence about President Kennedy’s murder has disappeared and also of how much has been preserved. There is now so much material in the public record about the assassination, including literally millions of pages of once-secret government files, that no reporter or scholar can claim to have seen it all. Whole collections of evidence have still not been adequately reviewed by researchers, almost exactly fifty years after the events they describe. I was the first researcher, for example, to be given full access to the papers of Charles Thomas, including the record of his struggle to get colleagues to pay attention to the astonishing story of Oswald and the “twist party” in Mexico City, and I did not see the material until 2013. The rose-pink suit worn by Jacqueline Kennedy in the motorcade is also stored in the modern, fortresslike complex in suburban Maryland. The suit, an American-made Chanel knockoff that was a favorite of the president’s (Mrs. Kennedy “looks ravishing in it,” he told a friend) is preserved in an acid-free container in a windowless vault. The vault is kept at a temperature of between 65 and 68 degrees Fahrenheit (between 18.3 and 20 degrees Celsius), the humidity set at 40 percent. The filtered air in the vault is changed at least six times every hour in order to help preserve the delicate wool fabric, which remains stained with the president’s blood. The whereabouts of Mrs. Kennedy’s iconic pink pillbox hat is a mystery; it was last known to be in the custody of her former personal secretary. A separate vault, kept at a constant temperature of 25 degrees Fahrenheit (−4 degrees Celsius), is used for the storage and preservation of a small strip of celluloid that is believed, by the National Archives, to be the most watched piece of film in the history of motion pictures. It was on those 486 frames of Kodachrome-brand 8mm color film that a Dallas women’s wear manufacturer, Abraham Zapruder, captured the terrible images of the assassination on his Bell & Howell home-movie camera. Much of Warren’s personal paperwork from the commission that bore his name is stored at the Library of Congress, just a few minutes’ walk down First Street from his former chambers at the Supreme Court. Warren, who died in 1974, might be startled to know that millions of Americans know of him principally because of the commission, not because of his history-making sixteen-year tenure as chief justice. The decision to preserve the vast library of investigative reports and physical evidence gathered by the Warren Commission, and now retained at the National Archives and the Library of Congress, was meant to be reassuring to the public—proof of the commission’s transparency and of its diligence. At the National Archives alone, there are more than five million pages of documents related to the assassination. But the truth about the Warren Commission, as most serious historians and other scholars will acknowledge, even those who fully support its findings, is that its investigation was flawed from the start. The commission made grievous errors. It failed to pursue important evidence and witnesses because of limitations imposed on the investigation by the man who ran it, Chief Justice Warren. Often, Warren seemed more interested in protecting the legacy of his beloved friend President Kennedy, and of the Kennedy family, than in getting to the full facts about the president’s murder. On the subject of the assassination, history will be far kinder to the commission’s surviving staff lawyers, as well as its former in-house historian, who reveal in this book what really happened inside the Warren Commission. Much of this book is their story, told through their eyes. The lawyers, mostly in their twenties and thirties at the time of the investigation, were recruited from prestigious law firms, law schools, and prosecutors’ offices around the country. Most are now at the end of long careers in law or public service. For several, being interviewed for this book was the first time they have talked in this much detail, certainly to any journalist, about the commission’s work. Many have kept their silence for decades, fearful of being dragged into ugly, and often unwinnable, public debates with the armies of conspiracy theorists. Without exception, all of these men—the one woman among the lawyers, Alfredda Scobey, died in 2001—retained pride in their individual work on the commission. Many, however, were outraged to discover how much evidence they were never permitted to see. It is evidence, they know, that is still rewriting the history of the Kennedy assassination. © 2013 Philip Shenon. All rights reserved. Website design and hosting by Authors on the Web.